This article is about the original television programme. For the title character, see Mr. Bean (character). For other uses, see Mr. Bean (disambiguation). Mr. Bean is a British sitcom created by Rowan Atkinson and Richard Curtis, produced by Tiger Aspect Productions and starring Atkinson as the title character. The sitcom consisted of 15 episodes that were co-written by Atkinson alongside Curtis and Robin Driscoll; for the pilot, it was co-written by Ben Elton. The series was originally broadcast on ITV, beginning with the pilot on 1 January 1990 and ending with "The Best Bits of Mr. Bean" on 15 December 1995. The fourteenth episode, "Hair by Mr. Bean of London", was not broadcast on television until 25 August 2006 on Nickelodeon. Based on a character originally developed by Atkinson while he was studying for his master's degree at Oxford University, the series centres on Mr. Bean, described by Atkinson as "a child in a grown man's body", as he solves various problems presented by everyday tasks and often causes disruption in the process. The series has been influenced by physical comedy actors such as Jacques Tati and those from early silent films. During its original five-year run, Mr. Bean met with widespread acclaim and attracted large television audiences. The series was viewed by 18.74 million viewers for the episode "The Trouble with Mr. Bean" and has received a number of international awards, including the Rose d'Or. The series has also been sold in 245 territories worldwide and has inspired an animated spin-off and two theatrical feature-length films along with Atkinson reprising his role as Mr. Bean for a performance at the London 2012 Summer Olympics opening ceremony, television commercials and several sketches for Comic Relief. Besides the acclaim of the show, another reason for the show's appeal in hundreds of territories worldwide is the fact that the show uses very little intelligible dialogue, making it much more accessible to people who know little-to-no English. The character of Mr. Bean was developed while Rowan Atkinson was studying for his master's degree in electrical engineering at The Queen's College, Oxford. A sketch featuring Bean was shown at the Edinburgh Fringe in the early 1980s. A similar character called Robert Box, also played by Atkinson himself, appeared in the one-off 1979 ITV sitcom Canned Laughter which also featured routines used in the motion picture in 1997. One of Bean's earliest appearances occurred at the "Just for Laughs" comedy festival in Montreal, Quebec, Canada, in 1987. When programme coordinators were scheduling him into the festival programme, Atkinson insisted that he perform on the French-speaking bill rather than the English-speaking programme. Having no French dialogue in his act at all, programme coordinators could not understand why Atkinson wanted to perform on the French bill instead. As it turned out, Atkinson's act at the festival was a test platform for his character and he wanted to see how his character's physical comedy would fare on an international stage with a non-English speaking audience. The character's name was not decided until after the first episode had been produced; a number of other vegetable-influenced names such as "Mr. Cauliflower" were explored. Atkinson cited the earlier comedy character Monsieur Hulot, created by French comedian and director Jacques Tati, as an influence on the character. Stylistically, Mr. Bean is also very similar to early silent films, relying purely upon physical comedy with Mr. Bean speaking very little dialogue (although like other live-action sitcoms during this period, it featured a laugh track). This has allowed the series to be sold worldwide without any significant changes to dialogue. In November 2012, Atkinson told The Daily Telegraph of his intentions to retire the character, stating that "someone in their fifties being childlike becomes a little sad." In 2016 however, Atkinson changed his mind by saying that he would never retire playing Mr. Bean. 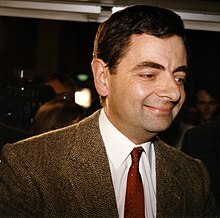 Rowan Atkinson portraying Mr. Bean in August 1997. The title character and main protagonist, played by Rowan Atkinson, is a childish buffoon who brings various unusual schemes and contrivances to everyday tasks. He lives alone at the address of Flat 2, 12 Arbour Road, Highbury, and is almost always seen in his trademark tweed jacket and a skinny red tie. He also usually wears a digital calculator watch. Mr. Bean rarely speaks, and when he does, it is generally only a few mumbled words which are in a comically low-pitched voice. His first name (he names himself "Bean" to others) and profession, if any, are never mentioned. In the first film adaptation, "Mr." appears on his passport in the "first name" field and he is shown employed as a guard at London's National Gallery. Mr. Bean often seems unaware of basic aspects of the way the world works, and the programme usually features his attempts at what would normally be considered simple activities, such as going swimming, using a television set, interior decorating or going to church. The humour largely comes from his original (and often absurd) solutions to problems and his total disregard for others when solving them, and his pettiness and occasional malevolence. 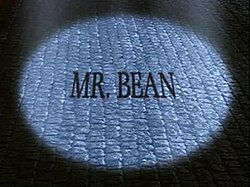 In the beginning of episode two, Mr. Bean falls from the sky in a beam of light accompanied by a choir singing Ecce homo qui est faba ("Behold the man who is a bean") which was sung by the Southwark Cathedral choir in 1990. The opening sequence was initially in black and white in episodes two and three, which was intended by the producers to show his status as an "ordinary man cast into the spotlight". However, later episodes showed Mr. Bean dropping from the night sky in a deserted London street against the backdrop of St Paul's Cathedral. At the end of episodes three and six, he is also shown being sucked right back up into the sky in the respective background scenes (black scene in episode 3 and street scene in episode 6). Regarding the opening credits, Atkinson has acknowledged that Bean "has a slightly alien aspect to him". In the Mr. Bean: The Animated Series episode "Double Trouble", the alien aspect of him was used in a storyline in which he is taken inside a spacecraft with aliens who look exactly like him and even have their own plushy toys. In an obvious homage towards the end, the aliens send him back home in a beam of light and music similar to the opening of the original Mr. Bean series. Whether Bean is an extraterrestrial is not made clear. Mr. Bean's long-suffering girlfriend, Irma Gobb (played by Matilda Ziegler), appears in three episodes. In "The Curse of Mr. Bean" and "Mr. Bean Goes to Town", the character is simply credited as "the girlfriend". She is treated relatively inconsiderately by Bean, who appears to regard her more as a friend and companion rather than as a love interest. However, he does become jealous when she dances with another man at a disco in "Mr. Bean Goes to Town" and she certainly expects him to propose to her on Christmas Day in "Merry Christmas, Mr. Bean"; his failure to do so results in her leaving him for good. Despite this, she later reappears in Mr. Bean: The Animated Series. It is revealed in the book Mr. Bean's Diary that Bean met Irma Gobb at a local library. Ziegler has also played a waitress, a mother and a policewoman. In the Comic Relief sketch "Torvill & Bean", Bean is accompanied by a female companion portrayed by Sophie Thompson whose overall appearance resembles Gobb's. Teddy is Mr. Bean's teddy bear and, apparently, best friend. 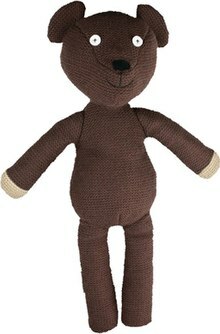 This little brown bear is a knitted oddity with button eyes and sausage-shaped limbs which invariably end up broken in half or in various other states of destruction and disfiguration. Although Teddy is inanimate, Mr. Bean often pretends it is alive in which he always buys it a Christmas present or tries not to wake it up in the morning. For example, when Mr. Bean hypnotizes Teddy, he snaps his fingers and the bear's head falls backwards as if it had fallen asleep instantly (Bean used his finger to prop Teddy's head up). Teddy is often privy to Mr. Bean's various schemes and doubles as a tool or other items in emergencies; it has been decapitated ("Mr. Bean in Room 426"), used as his paint brush ("Do-It-Yourself Mr. Bean") and shrunk in the wash ("Tee Off, Mr. Bean"). Teddy is also Mr. Bean's "pet" in "Hair by Mr. Bean of London" where he is used to win a pet show. Over the years, Teddy has undergone several changes. When it debuted on "The Trouble with Mr. Bean", it had a smaller head. Two episodes later, its head reached its current size but its "eyes" were not present until Bean placed gold thumb tacks on its face. The "eyes" have since been replaced with two small white buttons sewn over Teddy's face, giving it a distinctive image. After filming ended, Teddy was donated by Atkinson to Gyles Brandreth's Teddy bear museum in Stratford-upon-Avon. In 2008 upon the museum's closing, Teddy was sold at auction for £180. 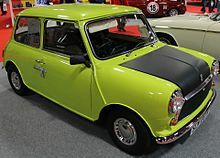 Mr. Bean's vehicle, a citron-green 1977 British Leyland Mini 1000 Mark 4 with a matte black bonnet, was central to several antics such as Bean getting dressed in it, driving while sitting in an armchair strapped to the roof or attempting to avoid a car park fee by driving out through the entrance. In the pilot episode, Bean's vehicle was originally an orange 1969 BMC Morris Mini 1000 Mark 2 (registration RNT 996H), but was accidentally destroyed in an off-screen crash at the end. Throughout the sitcom, Bean keeps it locked with a bolt-latch and padlock rather than the lock fitted to the car, which formed a running gag in several episodes; in two episodes, he demonstrated an additional and innovative security measure in that he removes the steering wheel instead of the key which in one episode deterred a car thief. In "Back to School Mr. Bean", Bean's Mini is crushed by a tank as part of a demonstration after he replaced an identical Mini (registration ACW 497V) meant for the demonstration with his own to secure a parking space. After losing it, he removes his padlock and bolt-latch from the remains. Although the Mini has been crushed, it nonetheless reappears in subsequent episodes with the same colours and registration number (SLW 287R) as the car that has been crushed. There were three Minis painted green and black used in the series, as well as two others painted with the same colour scheme but with no engine that got crushed by the tank. One of the main cars was also crushed by the tank. During filming many parts were swapped from car to car throughout production, including bonnets, wheel trims, grilles, steering wheels, rear lights, occasionally the driver's door and the seat covers. After filming ended, one of the original Minis was sold to Kariker Kars to be hired for various events whereupon it was temporarily displayed as a major attraction at the Rover Group's museum. In 1997, it was purchased by the Cars of the Stars Motor Museum and displayed for a number of years, later being sold on to a museum in the United States. The main Mini is privately owned and nearing the end of a restoration in the south of England. To promote Mr. Bean: The Animated Series, a replica of the Mini with the registration number DRW 221T was used. This Mini is currently on display at the National Motor Museum, Beaulieu. [not in citation given] The London Motor Museum also has a replica on display. The Mini was going to appear in the first film adaptation of the series under the registration C607 EUW. In the film, Mr. Bean drives his Mini through Harrods in order to avoid a traffic jam. Although the sequence was filmed, it was not included in the final cut. In June 2018, the Mini from the first film was sold for US$70,000. The Mini eventually had its debut on the big screen when it was featured in the film Mr. Bean's Holiday under the registration YGL 572T. Differently to the Minis before (which use the colour Austin Citron green), the Mini in the film is instead 'Nissan Amarillo Yellow'. The film also featured a second version of the Mini with exactly the same colour scheme yet with left-hand drive, driven by the female character befriended by Bean named Sabine (played by Emma de Caunes). The Mini reappears in Mr. Bean: The Animated Series under the registration STE 952R. In 2015, Mr. Bean returned in a sketch for Comic Relief (set at a funeral) in which he drives his Mini to attend it. This Mini bore the same registration as the one in the animated spin-off. Since the pilot episode, Mr. Bean has a long-running feud with the unseen driver of a light-blue 1972 Reliant Regal Supervan III (registration GRA 26K) which would usually get turned over, crashed out of its parking space and so forth by Bean in his Mini, who is usually oblivious to the results. These mishaps also became a running gag throughout the series. In "Tee Off, Mr. Bean", Bean is hitchhiking and the Reliant pulls over for him but Bean, who recognizes the car, pretends to not see it until it leaves. Although Mr. Bean is the only significant character in the programme, others appear usually as foils for his various antics. Other than his girlfriend Irma Gobb (Matilda Ziegler), there are more characters in each episode. However several notable British actors and comedians appear alongside Atkinson in the series as various one-off supporting characters, including Owen Brenman, Richard Briers, Roger Sloman, Angus Deayton, Stephen Frost, Nick Hancock, Christopher Ryan, Paul Bown, Caroline Quentin, Danny La Rue, Roger Brierley, Roger Lloyd-Pack, Rupert Vansittart, David Battley, David Schneider, Richard Wilson and Rudolph Walker. Vansittart and Walker would later appear alongside Atkinson in The Thin Blue Line. All 15 episodes of Mr. Bean were produced by Tiger Aspect Productions. Additionally, the character has been used in one-off sketches, guest appearances and television commercials in the United Kingdom. Mr. Bean originally aired in the United Kingdom on ITV from 1990 to 1995 with reruns later shown on Comedy Central Extra. Due to its popularity, the series aired in many other countries; in the United States, it aired on HBO starting on 2 April 1992, and also ran on PBS television stations across the U.S. Reruns of the series were also shown on Fox Family during the late 1990s both as segments in the variety series Ohh Nooo! Mr. Bill Presents and as stand-alone episodes. The theme was later released on Goodall's album Choral Works. Goodall also wrote an accompanying music track for many episodes. The first episode of Mr. Bean did not feature the choral theme tune, but instead an up-beat instrumental piece, also composed by Howard Goodall, which was more an incidental tune than a theme. It was used while Bean drove between locations intimidating the blue Reliant, and as such, was sometimes heard in later episodes whenever Bean's nemesis is seen. The instrumental of the theme tune was used in animated Mr. Bean in the original series finale "Double Trouble". In the episode "Tee Off, Mr. Bean", Howard Goodall's choral theme tune for another Richard Curtis comedy, The Vicar of Dibley, is heard playing on a car stereo. In "Merry Christmas, Mr. Bean", while playing with Queen's Royal Guards figurines and the nativity set, he hums "The British Grenadiers", which was quoted in the theme to Blackadder Goes Forth. Mr. Bean appeared in the music video of a 1991 Comic Relief fundraising single by Hale and Pace titled "The Stonk". Mr. Bean also appeared in the music video for Boyzone's single "Picture of You", which was the main theme song for the first film adaptation. Mr. Bean also made a Comic Relief record in 1992 titled "(I Want To Be) Elected" and was credited to 'Mr. Bean and Smear Campaign featuring Bruce Dickinson'. It was a cover of the Alice Cooper song of the same name and reached number 9 in the UK singles chart. The first episode won the Golden Rose, as well as two other major prizes at the 1991 Rose d'Or Light Entertainment Festival in Montreux. In the UK, the episode "The Curse of Mr. Bean" was nominated for a number of BAFTA awards; "Best Light Entertainment Programme" in 1991, "Best Comedy" (Programme or Series) in 1991, and Atkinson was nominated three times for "Best Light Entertainment Performance" in 1991 and 1994. Seven years following the end of the original live-action series, Mr. Bean reappeared in an animated television series with Rowan Atkinson reprising his role as the title character as well as providing references for all of Bean's animated actions. Much like the original live-action series, the animated spin-off contains little dialogue; although some words are spoken most is either little soundbites or mumbling. The series introduced a list of new characters alongside regulars in the original series (such as Teddy and Irma Gobb), including an unpleasant landlady of Mr. Bean named Mrs. Wicket and her evil one-eyed cat Scrapper. Other characters' voices are provided by Jon Glover, Rupert Degas, Gary Martin and Lorelei King. From 2002 to 2004, 52 episodes were originally broadcast on ITV1 each consisting of two 11-minute segments. In 2015, CITV commissioned a brand new series of episodes. The new series amended the format in which it featured episodes that had much more dialogue than normal. 78 new episodes began broadcasting from 6 February 2015. Two theatrical feature-length films featuring Mr. Bean have been released with Atkinson reprising his role as the character in each. The first film, Bean, was directed by Mel Smith, released in 1997 and followed the misadventures of Mr. Bean as he oversaw the transfer of Whistler's Mother to a Los Angeles art gallery. The film broke from the programme's traditional narrative by using a subplot with more developed characters whereby Bean was not the sole centre of attention, but interacted with a suburban Californian family that he stays with during the film. The film was commercially successful, grossing more than US$250 million globally ($45 million in the USA) on a budget estimated at $18 million, despite receiving mixed reviews from critics and holding a 41% approval rating on Rotten Tomatoes. The second film, Mr. Bean's Holiday, was directed by Steve Bendelack, released in 2007 and followed Bean on an eventful journey across France for a holiday in the French Riviera to which, after a number of mishaps, culminates in an unscheduled screening of his video diary at the 2006 Cannes Film Festival, despite an earlier rumour in February 2001 stating that an unused script by Richard Curtis would see him on an Australian misadventure. Production on the film occurred during 2006 and was first released in the United Kingdom on 30 March 2007; it premiered in North America on 17 July that year at the Just for Laughs festival in Canada where the character had been launched 20 years earlier before being released nationwide over a month later on 24 August. The film is notable for featuring a mixture of traditional film photography and home-shot video camera photography. Despite also receiving mixed reviews from critics, the film was also commercially successful, grossing nearly US$230 million globally ($33 million in the United States) against a $25 million budget. The second film was the last live-action appearance of the character until the 2012 London Olympics opening ceremony. Top Funny Comedian: The Movie is a 2017 spin-off of a Chinese variety show of the same name; the plot involves a number of characters getting involved in a series of misadventures during a visit to Macau at the same time as Mr. Bean, a supporting character in the film. One of the film's stars, comedian Guo Degang, informed media outlet The Beijinger that due to Atkinson being unable to speak Mandarin, the cast used mainly body language to speak to each other saying that "with facial expressions and gestures we seemed to understand each other, [it] was really an interesting experience, which proves that comedy can cross boundaries." The film has only been released in Chinese territories, and has yet to receive an American or European release. In 2012, Atkinson reprised his character for a live performance as part of the 2012 Summer Olympics opening ceremony. In the scene, Mr. Bean works within the London Symphony Orchestra in its performance of "Chariots of Fire", conducted by Simon Rattle. For this scene, Bean does not wear his usual brown tweed sports jacket but the traditional clothing of the musician - white tie and tails. As they perform the piece, Bean is mostly bored with playing the same note repeatedly on the synthesiser and gets jealous of the more interesting part being played on the grand piano. Still bored, he takes out his mobile phone and takes a picture of himself, looking proud. He then sneezes in a comical fashion and tries to retrieve his handkerchief from his bag behind him, finding he cannot reach it while at the synthesizer until he uses an umbrella to maintain his performance. When he finally blows his nose with his serviette, he throws it into the grand piano. He then falls asleep continuing to play the note. A dream sequence of the opening scene of the film Chariots of Fire shows the characters running across a beach, though Mr. Bean dreams he is running with them. He begins to fall behind, until he hails a car to overtake all the others. Now running in front, Bean ensures he wins the race on the beach by tripping one of the runners trying to overtake him, whereupon he crosses the line with elation, and then wakes up. Finding that the rest of the orchestra have stopped playing while he continued his one recurring note, Bean, with encouragement from Rattle, plays an extended flourish and lastly touches a note that makes a flatulent sound then stops. Two books tied-in to the original live-action series were released: Mr. Bean's Diary in 1992 and Mr. Bean's Pocket Diary in 1994. The two books have identical content and differ only in the format in which they are printed. The content of both is a template diary with handwritten content scrawled in by Mr. Bean. They provide some additional information on the setting: for example, they establish that Mr. Bean lives in Highbury and rents his flat from a landlady named Mrs. Wicket. They confirm the name of Mr. Bean's girlfriend as "Irma Gobb" and also give the name of the other man she actually dances with in Mr. Bean Goes to Town (Giles Gummer). An additional book also called Mr. Bean's Diary was released in 2002 to accompany Mr. Bean: The Animated Series; this book was also graded as a children's reader. Rowan Atkinson has appeared in character as Bean in many television broadcasts, sometimes as a publicity stunt to promote a new episode, DVD or film. A number of short sketches for the Comic Relief telethon have also been produced and Bean also starred in various commercials and music videos. The series was available on a number of Thames Television VHS compilations. In the United Kingdom (Region 2), episodes of Mr. Bean were released on a yearly basis by Universal Pictures UK from 2004. The complete collection is now available, including the two feature films and other extras. The episodes were released on VHS by A&E Home Video in the United States in the 1990s. These releases are unique in that they contain the original opening credits for the first three episodes, as seen when originally broadcast on television. In addition, they contain extra scenes which were edited into certain episodes at the request of PBS, in order to extend the runtime for a commercial-free airing. In Canada, Mr. Bean was released on VHS by Polygram Home Video. In the United States (Region 1), the complete series has been available since 2003 on A&E Home Video as "The Whole Bean". The documentary "The Story of Mr. Bean" is edited on both the UK and USA DVD sets: It was originally 52 minutes when broadcast on TV. However, it is 48 minutes on the UK DVD while only 40 on the American DVD. Most notably, in the UK version, the section detailing "The Tall Guy" has humorous clips from the film removed. The American DVD features the same edits as the British DVD but is also missing comments by Burt Reynolds on the set of Bean, comments by Jeff Goldblum, some clips from the show Mr. Bean and many others. The record-selling UK videos were withdrawn shortly before the release of Bean, and DVDs were released on an annual basis since 2004. In August 2009, an official YouTube channel of the series was launched featuring content from both the original live-action and animated series. The Amazing Adventures of Mr. Bean 2; "Mr. Bean" and "The Return of Mr. Bean"
The Exciting Escapades of Mr. Bean 2; "The Curse of Mr. Bean" and "Mr. Bean Goes to Town"
The Terrible Tales of Mr. Bean 2; "The Trouble with Mr. Bean" and "Mr. Bean Rides Again"
The Merry Mishaps of Mr. Bean 2; "Merry Christmas, Mr. Bean" and "Mr. Bean in Room 426"
The Perilous Pursuits of Mr. Bean 2; "Mind the Baby, Mr. Bean" and "Do-It-Yourself, Mr. Bean"
Unseen Bean 2; "Back to School, Mr. Bean" and "Hair by Mr. Bean of London"
The Final Frolics of Mr. Bean 2; "Tee Off, Mr. Bean" and "Goodnight, Mr. Bean"
The Complete Mr. Bean (Volume 1) 7; "Mr. Bean", "The Curse of Mr. Bean", "The Trouble with Mr. Bean", "Merry Christmas, Mr. Bean", "Mind the Baby, Mr. Bean", "Back to School, Mr. Bean" and "Goodnight, Mr. Bean"
The Complete Mr. Bean (Volume 2) 7; "The Return of Mr. Bean", "Mr. Bean Goes to Town", "Mr. Bean Rides Again", "Mr. Bean in Room 426", "Do-It-Yourself, Mr. Bean", "Tee Off, Mr. Bean" and "Hair by Mr. Bean of London"
Mr. Bean — The Complete Collection 14 + 4 (special ep.) 28 November 2011 Contains all 15 episodes (Digitally Remastered) + Mr. Bean: The Animated Series episodes + two films. Rowan Atkinson in Mr. Bean: 1 3 1 November 2004 Episodes: Episode 1: Mr. Bean, Episode 2: The Return of Mr. Bean, Episode 14: Hair by Mr. Bean of London. Bonus Features: In the Pink, The Library. Rowan Atkinson in Mr. Bean: 2 3 31 October 2005 Episodes: Episode 3: The Curse of Mr. Bean, Episode 4: Mr. Bean Goes to Town, Episode 5: The Trouble with Mr. Bean. Bonus Features: Royal Bean. Rowan Atkinson in Mr. Bean: 3 3 13 November 2006 Episodes: Episode 10: Mind the Baby, Mr. Bean, Episode 8: Mr Bean in Room 426, Episode 6: Mr. Bean Rides Again. Bonus Features: Behind the scenes of Mr. Bean's Holiday. Rowan Atkinson in Mr. Bean: 4 3 19 March 2007 Episodes: Episode 9: Do-It-Yourself Mr. Bean, Episode 11: Back to School Mr. Bean, Episode 12: Tee Off, Mr. Bean. Bonus Features: Treasure!. Rowan Atkinson in Mr. Bean: 5 2 12 November 2007 Episodes: Episode 7: Merry Christmas Mr. Bean, Episode 13: Goodnight Mr. Bean. Extra Features: 2007 Comic Relief Sketch, Art Thief, Scaredy Bean, Haircut. Rowan Atkinson in Mr. Bean: The Complete Collection of the Classic TV Series (5 DVD Set) 14 18 November 2008 Contains: Rowan Atkinson in Mr. Bean: 1 and 2 (2 DVD Set), Rowan Atkinson in Mr. Bean: 3 and 4 (2 DVD Set) and Rowan Atkinson in Mr. Bean: 5. Happy Birthday Mr. Bean 3 6 September 2010 Contains: The Restaurant from The Return of Mr. Bean, Birthday Bear (Animated Episode), The Disco from Mr. Bean Goes to Town, Dinner for Two (Animated Episode), The FunFair from Mind the Baby, Mr. Bean, The Restaurant (Animated Episode). Merry Christmas Mr. Bean 1 1 November 2010 Episode 7: Merry Christmas Mr. Bean. Back to School Mr. Bean 3 4 August 2014 Contains: Episode 11 Back to School Mr. Bean, The Library, The Exam. Mr. Bean: The Whole Bean was re-released on 24 March 2015 on DVD digitally remastered to coincide with the series' 25th anniversary. The sale of Mr. Bean worldwide has enabled his character to secure a place in the popular culture of several countries. Notably, a number of public figures have been compared to the character usually as an insult. For instance, then-Prime Minister of the United Kingdom Tony Blair was identified by Homer Simpson as "Mr. Bean" when his cartoon form greeted the Simpsons upon their arrival to the United Kingdom in an episode of the eponymous programme, allegedly demonstrating the stereotypical view of the British by Americans. Arthur Batchelor, one of the Royal Navy captives held by Iran during the 2007 Iranian seizure of Royal Navy personnel, stated that some of his captors had mocked him calling him "Mr. Bean". NRL referee Sean Hampstead is regularly nicknamed "Mr. Bean" in nationally broadcast commentary by Australian television/radio personality Ray Warren as a result of his similar appearance. In 2007, Vincent Cable, the acting leader of the Liberal Democrats at the time, described the recent decline in Prime Minister Gordon Brown's fortunes as his "remarkable transformation in the last few weeks from Stalin to Mr. Bean". The former Spanish Prime Minister José Luis Rodríguez Zapatero is often mocked in his own country for his facial resemblance to Mr. Bean to which a computer hacker broke into Spain's official website for its presidency of the European Union, inserting the character on the front page of the website. Satirists have also compared Zapatero to Mr. Bean when discussing government policies that are deemed to have been unsuccessful. Several of the visual jokes in the series have been used as experiments on the Discovery Channel series MythBusters. In episode 52 – "Mind Control", the idea of painting a room with explosives (fireworks or other) placed in a tin of paint, as seen in "Do-It-Yourself Mr. Bean", was tested and deemed impossible as adequate coverage was not achieved. An image of Mr. Bean grinning mischievously has been used as an internet meme for highlighting sexual double entendres, usually accompanied by the statement "If you know what I mean." Though Rowan Atkinson isn't typecast to characters like Mr. Bean, he has played similar characters in other works such as Enrico Pollini in the 2001 film Rat Race and Johnny English in the eponymous film series. In Tetsuo Hara and Buronson's manga Souten no Ken, a parody of Mr. Bean can be found in a minor character appearing in Chapter 45, contained in Vol. 5. 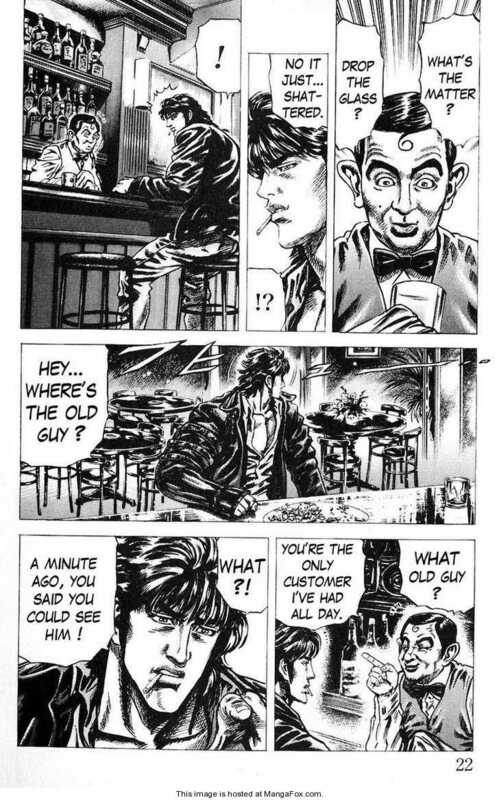 In it, a barman identical to Mr. Bean tends the main character Kenshiro Kasumi for comic relief. In the video game Resident Evil 2, during the opening sequence in the streets of Raccoon City, Mr. Bean's British Leyland Mini 1000 can be seen parked against a barricade. Mr. Bean has also been influential on later series, such as The World of Lee Evans. Private Eye magazine in the UK, features a cartoon strip, The Adventures of Mr Milibean; in which the-then Labour Party leader Ed Miliband is drawn as Bean. Milliband was depicted as Bean by cartoonists. An image of Mr. Bean is employed on the cybercrime website "Mr. Bin." In the video game Grand Theft Auto V, Mr. Bean's British Leyland Mini 1000 is featured in an online multiplayer mission in which the vehicle has the same colour scheme and registration number SLW 287R. In the game, players are required to steal the Mini during 'Business Battles' and drive it back to their nightclub property. ^ a b "Mr Bean — Timeline". Tiger Aspect Productions Ltd. Archived from the original on 19 December 2013. Retrieved 8 February 2014. ^ "Mr. Bean - Episode Guides - Series 1 - Episode 14". British Comedy Guide. Retrieved 28 February 2013. ^ a b c "Atkinson has Bean there and he's done with that". Archived from the original on 18 October 2006. ^ Viewing figures at the Internet Movie Database. Retrieved 14 March 2008. ^ Canned Laughter at the Internet Movie Database. Retrieved 14 March 2008. ^ a b c Interview with Rowan Atkinson Archived 5 April 2008 at the Wayback Machine at justforlaughs.com. Retrieved 14 March 2008. ^ Mr Bean official website Archived 16 August 2010 at the Wayback Machine. Retrieved 6 September 2010. ^ Transcript of interview with Rowan Atkinson[permanent dead link] at bbc.co.uk. Retrieved 14 March 2008. ^ Just for Laughs festival Archived 10 October 2007 at the Wayback Machine. Retrieved 14 March 2008. ^ Victoria Ward (17 November 2012). "Rowan Atkinson suggests end is in sight for Mr Bean". The Daily Telegraph. Retrieved 2 November 2018. ^ "Rowan Atkinson signals the end for Mr Bean: 'Playing him is childish and sad'". Metro. DMG Media. 17 November 2012. Retrieved 25 October 2013. ^ "Rowan Atkinson: I will never wave goodbye to Mr Bean". RadioTimes. Archived from the original on 24 March 2016. Retrieved 23 March 2016. ^ "The Fine Art of Being Mr. Bean", archive interview in The Buffalo News. Retrieved 15 June 2006. ^ "Matilda Ziegler". IMDb. Retrieved 4 October 2014. ^ "Mr Bean's toy in teddy bear sale". BBC News. 9 September 2008. Retrieved 12 June 2018. ^ "Mr Bean: 25 facts and figures for his 25th anniversary". Radio Times. 15 February 2015. ^ "National Motor Museum, Beaulieu". Retrieved 13 June 2018. ^ Alternative versions at the Internet Movie Database. Retrieved 1 September 2010. ^ "Deleted scene". Retrieved 21 September 2011. ^ Credits at the Internet Movie Database. Retrieved 17 April 2008. ^ howardgoodall.co.uk Archived 5 February 2012 at the Wayback Machine. Retrieved 13 March 2008. ^ The Stonk at YouTube. Retrieved 14 March 2008. ^ "Picture of You" music video. Retrieved 14 March 2008. ^ "I want to be Elected" disc information. Retrieved 14 March 2008. ^ BBC Guide to Comedy, written by Mark Lewisohn. Retrieved 3 August 2006. ^ Awards at IMDb. Retrieved 3 August 2006. ^ "Mr Bean turned into cartoon". 6 February 2001. Retrieved 10 September 2015. ^ "Hulu gets Mr. Bean animated series". StreamDaily. 8 June 2015. Retrieved 3 March 2017. ^ "Bean (1997)". Box Office Mojo. Retrieved 26 December 2010. ^ Box office figures at boxofficemojo.com. Retrieved 7 December 2008. ^ Mr. Bean's Holiday at IMDb. Retrieved 4 August 2006. ^ "Bean Down Under For Rowan Atkinson". cinema.com. 7 February 2001. Retrieved 19 December 2015. ^ "Mr. Bean's Holiday (2007)". Box Office Mojo. 24 August 2007. Retrieved 26 December 2010. ^ "Mr Bean is a Has-Bean". 29 October 2007. Archived from the original on 29 October 2007. Retrieved 22 March 2016. ^ "Rowan Atikinson is reprising his role as Mr Bean for a Chinese film". 20 March 2017. ^ Boult, Adam (20 March 2017). "Mr Bean returns in new film - but it's only released in China" – via www.telegraph.co.uk. ^ "Mr Bean returns! Rowan Atkinson reprises his most iconic role in rare appearance". Hindustan Times. 23 March 2017. ^ "Kanaal van MrBean". YouTube. 1 January 1990. Retrieved 26 December 2010. ^ a b "Amazon.com: Mr. Bean: The Whole Bean (Complete Series): Rowan Atkinson, John Birkin: Movies & TV". ^ "Shout! Factory - Mr. Bean: The Whole Bean [Remastered 25th Anniversary Collection]". ^ "EU website hijacked by Mr Bean". ^ "Annotated Mythbusters". Retrieved 2 June 2008. ^ "If You Know What I Mean Meme". WeKnowMemes LLC. Retrieved 27 June 2012. ^ "Pages of the manga Souten no Ken, with a character very similar to Mr. Bean in appearance". Archived from the original on 4 September 2013. Retrieved 15 February 2012. ^ "Exclusive interview: Is Ed Miliband ready?". Financial Times. 2 October 2016. ^ Krebs, Brian (4 May 2016). "Carding Sites Turn to the 'Dark Cloud'". Krebs on Security. Retrieved 16 May 2016.